"Yeah, well, appearances can be deceiving!" Other Stars: Kelsey Grammer, Philip Van Dyke, Catherine O'Hara, Andrea Martin, Tim Curry, Jennifer Tilly, French Stewart, and Diedrich Bader. This animated movie is by the creators of Anastasia. Bartok is an adventurous animated comedy about a Russian bat called upon by the Russian people to find their young and kind prince, Ivan, who has been kidnapped. It all starts when Prince Ivan (Philip Van Dyke) watches Bartok giving a musical performance on the street. The performance tells how Bartok has saved Mongolia from a fire, by swallowing the fire and then drinking the whole lake, and how he has fought a dragon, and succeeded while the dragon did not, because Bartok knew his Kung-Fu. I liked this scene because Bartok makes the commoners and peasants happy, which is kind of foreshadowing what will happen later on. During the performance a ferocious brown bear shows up, and terrorizes the town. So, Bartok ties him up, and puts him in his performance wagon (but the people did not know that this bear is an actor and comrade of Bartok, named Zozi). Prince Ivan enjoyed this performance so much that he gave Bartok a ruby ring meant for a Romanoff, but his advisor, Ludmilla (Catherine O'Hara), does not like the prince's generosity. That night during a raging storm, Prince Ivan is kidnapped while sleeping in his bed. The following morning Ludmilla discovers the prince is gone and informs the people that the evil, solitary witch, Baba Yaga, who lives in the Iron Forest, is the one who has kidnapped Prince Ivan. The people believe what Ludmilla has told them, after all, she is the prince's advisor. So, it is Baba Yaga whom the villagers blame when their children are missing, dead, or hurt. An everyday Blair Witch. So, they call on Bartok "The Magnificent" to ask him if he would risk his life by going into the Iron Forest, and bring back Russia's beloved Prince Ivan. At first Bartok refuses the peoples' request, even with two chests filled with gold and other riches offered under his nose. But finally Bartok gives in because two children, with big, brown, puppy eyes, gently asked him if he would find their czar. I like this scene because Bartok knew what kind of challenges he would have to face, but decides to help anyway. Bartok is unsure of himself, but his friend Zozi (Kelsey Grammer) tells Bartok how much of a hero he is to the Russian people. This is a wonderful scene because it shows that there are always friends that help you in tough situations, as Zozi does when he sings Bartok a song to bring up Bartok's confidence. So, Bartok and Zozi, both full of confidence, head towards the mysterious Iron Forest, where only Bartok is let in by a giant skull (Tim Curry), who asks him riddles. This is my favorite scene in the whole movie, because the skull looks real, and acts like an everyday person! It's funny seeing a giant skull who's asking you riddles. But that's all I'm going to tell you. You'll have to watch the rest yourself! Extras Review: Besides Bartok's and Anastasia's trailers, the disc includes a couple of fun extras. 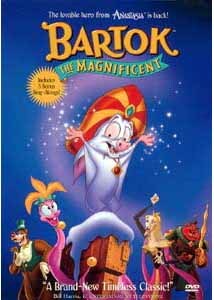 First, are three sing-alongs: Bartok the Magnificent, A Possible Hero and Someone's in My House. The second is a "Maze Game," that features three great mazes that you control with your remote control. In this you help Bartok find the same objects as in the movie, then you put the objects in the cauldron to find Prince Ivan. Fun! This is a great DVD for kids, because besides just watching the movie they can enjoy the three sing-alongs or try to find Prince Ivan in the mazes. Bartok teaches moral values in a way that kids can understand.